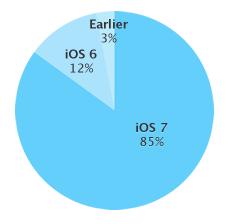 85% of iOS devices are running iOS 7 or later, Apple claims. Refreshing its iOS usage numbers on Monday, Apple measured usage of its most recent mobile OS for a seven‑day period ending March 23, 2014. Next in line, unsurprisingly, is iOS 6 which currently represents 12% of all iOS devices — while just 3% are running older versions of Apple’s mobile OS. The real comparison, however, is Google’s official Android version distribution — and the results don’t do Android any favors. A side-by-side comparison between iOS and Android does Google no favors whatsoever. Based on data collected during a seven-day period ending on March 3, 2014, a miniscule 2.5% of Android devices which accessed the Play Store had installed KitKat, the latest version of Google’s mobile OS. 62% percent of devices had Jelly Bean installed, while 35.5% of Android devices were still running earlier releases. Although Apple places more emphasis on users ugrading — providing firmware upgrades over the air and insisting that app developers keep up with the latest releases — it still serves as an example of how fragmented the Android OS is when compared to iOS.